Three important paper items about the murder of Chaim Arlozorov [1899-1933]. * Obituary notification upon the passing of Chaim Arlozorov, on behalf of the Histadrut's Central Bureau of Clerks. 32x48 cm. Tears in the margins, fine condition. 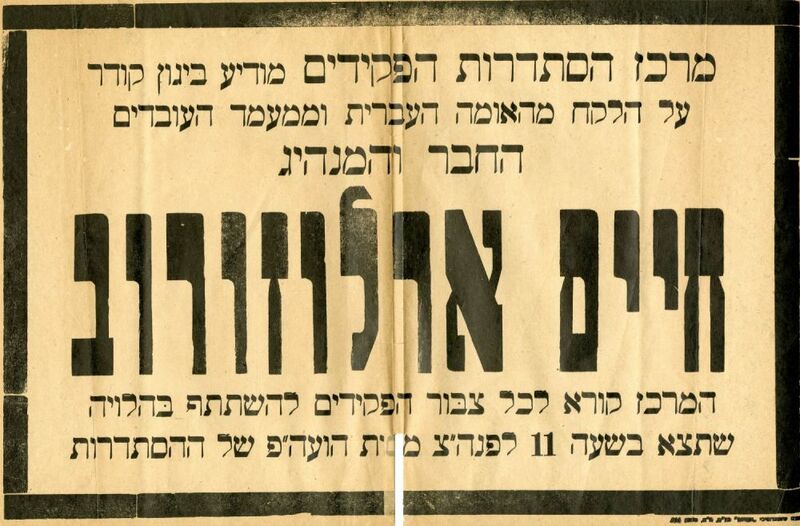 * Issue of BaShaar from 27/1/1934 - one-time publication for the workers and the masses about Arlozorov's murder, headlined: "The New Revisionist Provocation is Bribing Arabs to Remove Blame for Arlozorov's Murder from the Revisionists, Promising the Arabs Large Sums of Money. How the Revisionist's Scheme was Breached; Stavsky and Rosenblatt's Defense in the Turmoil." * Issue of Panim el Panim from June 29, 1955, headlined: "Who Murdered him? Special Investigation Reveals the First Episode in the Mystery of Arlozorov's Murder." Extensive articles and photographs in an attempt to reach the truth in the Arlozorov murder case: "After much consideration, Panim el Panim has decided to review the case episode by episode, as they were revealed then, with a single hope: perhaps it will help when matters are presented clearly, after a lapse of 22 years, to illuminate something of this tragic affair." Various sizes and conditions, overall moderate-fine condition.